The fundamental challenge for the cricket groundsman is to keep the pitch dry whilst maintaining the health of the grass plant. Ground covers are an essential tool in meeting the first objective but, when it comes to the second, need to be carefully managed – or they can have adverse effects. First, we need to look at why ground covers are so important in cricket – and is, of course due to the fact the game cannot be played in wet conditions. Bounce is critical and a wet pitch will not provide enough resistance – or hardness – for the ball to bounce effectively. This fact, combined with the uncertainty of the Great British weather (even during the summer playing season!) 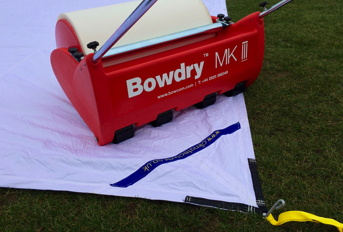 is the primary reason why effective ground covers are such an important piece of equipment for the cricket club. The majority of cricket pitch covers are deployed to cover the main area of play ‘the pitch’ during downpours immediately before or during a game; with the objective of allowing the planned match to go ahead once the rain has abated. However, in the infancy of the formal game, covering tended to be at the ends rather than the entire pitch. In the late 1700s, the covering of pitches were unregulated – the first appearance of the use of covers in a rule book was in 1788 when the covering of ends during a match was allowed ‘by mutual consent’ of the rival sides. 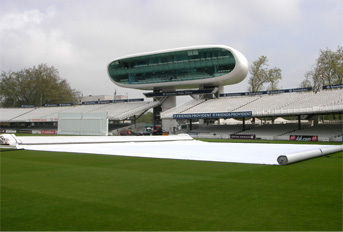 This law in itself caused issues – the use of tarpaulin sheets deployed to cover ends at venues as illustrious as Lord’s and The Oval during the 19th Century was often controversial, with captains on opposing sides objecting to their use. It was the early 1900s before the laws over the use of ground covers began to be formalised, and they have continued to evolve over the past century alongside advances in ground cover technology. Indeed, until the 1960s Test and County matches were played on uncovered pitches, retaining the old belief that the game should be as much a test against the elements as against the accuracy and guile of the bowlers. TV coverage of cricket matches, however, was a catalyst for change – televised matches that were delayed or abandoned due to poor weather were a broadcasters’ nightmare, so the attitude toward using ground covers became a positive one. Nowadays, the ECB and County Cricket Boards endorse their use and there is even funding available for their purchase. The result – what was for many years the preserve of first class and county grounds can now be found in regular use at league clubs and schools. Clubs using covers are now reaping the benefits – less abandoned matches means greater profitability from player retention to ticket sales and bar revenue. There are a range of different types of cricket ground cover on the market. At ‘entry level’ you will find basic flat sheet rain covers – often constructed from PE Polyethylene or PVC, these can be laid onto the pitch whilst it rains to prevent it getting too wet. However, as these ground covers are not breathable, their use is limited to a few hours immediately before or during match play. If they are left on for longer periods the grass plant will be unable to breathe, moisture and heat will be prevented from escaping the surface. Fundamentally, the space under any type of covering system creates a microcosm. Those that limit light and air movement inevitably create greater variances in normal climatic conditions. These changes, in turn, promote disease and poor grass plant health because they are not the conditions the grass plant will thrive in. To be in place for longer periods of time – and help with the long-term objective of drying the pitch out – a ground cover needs to allow temperature, moisture and air to circulate. Mobile pitch covers that are raised above the surface of the pitch do this and are quick and easy to deploy when rain stops play. Mobile cricket pitch covers can be made of a range of different materials – from canvas through to plastics and even metal, and come in different designs; including flat, pitched and domed. Mounted on wheels make them easy to manoeuvre and quick to deploy in the event of rain during play but the materials from which they are constructed has a bearing on how easy and quick they are to move; they need to be lightweight enough to move easily but not so lightweight that they blow away in a gust of wind. Being easy to move alongside the fact that they also allow air to circulate and reach the pitch is beneficial, but the topography of the ground can present limitations in their use. If a ground has a gradient within or across the line of play, or saddling is an issue, water can run down from higher up the ground and get underneath the raised cover. In this situation, flat sheet covers may be preferable as they can be deployed across a greater area of the ground; capturing water before it seeps on other pitches or ponds in one can be the difference in getting the game on or not. The correct design of flat sheet covers used with outfalls and water removal equipment can help during the game and in preparation. Some squares which lay flat or have low areas will greatly benefit from a flat system designed to suit their own ground. To meet this remit, the Climate Cover System a range of flat sheet covers have been designed to be left in place for extended periods, cover large area with minimum labour and promote grass plant health. Breathable and allowing light through the surface, they promote rather than inhibit growth and are hugely useful in prolonged rain fall or simply not to harm the grass whilst being covered. Alongside the goal of helping ‘get the game on’ when rain otherwise interrupts play, the tactical use of ground covers can aid the groundsman in meeting those key objectives of keep the pitch dry – and the grass plant alive. By alternating the use of mobile and flat sheet covers, you can control how the pitch dries out through evaporation, transpiration and drainage. Combined with an effective rolling programme this results in a surface that gives the desired hardness – and, in turn, performance. There are also Total Growth Covers that have been developed as germination covers that raise the temperature of the soil surface to the optimum level for germination while allowing light through to the grass plant to encourage growth. Whatever your club’s budget, the advice would be to invest in the best possible ground cover solution you can afford – at the very least, a decent single pitch flat sheet Rain Cover, which can be picked up for around a couple of hundred pounds, will pay dividends when it comes to enabling matches to continue should the weather be against you. 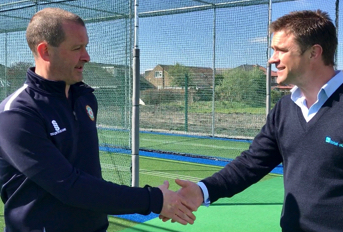 However, with funding streams available from bodies such as the ECB, NatWest Cricketforce and Sport England, with a little research and legwork even grass roots clubs could find themselves able to afford state-of-the-art solutions. As a former cricketer and Head Groundsman, total-play’s MD David Bates is well placed to understand the scope of cricket pitch covers. Not satisfied with existing products on the market, when setting up total-play back in 2007, he challenged long-held assumptions about sports surface covering and developed a range of proven products. In the development of the Climate Cover range, David drew on his knowledge from a career that saw him, as the youngest Head Groundsman on the County Circuit, be awarded two commendations from the ECB; spearhead research as the Chairman of the First Class Groundsman Committee and act as a trainer and pitch advisor for the IoG. The Climate Cover range includes flat sheets, raised covers, rain covers, growth systems and frost protection covers that are used by cricket, rugby football, tennis and golf clubs at all levels across the UK. Designed by the groundsman, for the groundsman in partnership with leading research laboratories it guarantees solutions that are fit for purpose as well as being easy to use and handle. The range’s flagship product – the Climate Cover System™ – is the lightest, strongest, truly breathable ground cover developed specifically for cricket. This class leading cricket pitch cover has evolved through the combined experience and expertise of groundsmen, agronomists and material specialists. It is made from a unique material that is extremely strong, translucent and breathable; importantly allowing light and air to pass through. This means that whilst it protects the surface from rain, it is also allowing heat and moisture vapour to escape; ensuring a healthier grass plant continues to grow underneath. In the 15 years since its development, the Climate Cover System™ has been proven to provide long-term pitch protection and turf enhancement benefits without compromising plant health or playing surface quality, the Climate Cover System™ is used at The Ageas Bowl, The Kia Oval, Emirates Old Trafford, the ECB National Academy, test match grounds, county grounds, local league clubs and schools across the country. Carrying a three year warranty, prices start at just over £1,000 for a 80ft x 15ft cover; sufficient for covering a single wicket. Covers are available in a range of different sizes offering configurations that can cover the entire table and also in bespoke sizes. With discounts available for NatWest Cricketforce registered clubs, alongside the various funding streams available to clubs looking to invest in ground covers there is an increasing trend in league clubs now investing in this state-of-the-art cricket pitch cover. Redeveloped for 2017 due to continued market demand for a high performance, budget cricket pitch cover solution. As with all total-play ground covers, in developing the Rain Cover, the team wanted to provide something better than currently available on the market. Following extensive testing, a 100% waterproof, semi-translucent Polyethylene material was selected. Designed with a translucency balance allowing light to reach the grass plant without the over exposing nature of a transparent material. The new material is strong, waterproof and UV stabilised with re-inforced hems, eyelets and handles. The Rain Cover checks the box for clubs seeking an affordable, effective and durable flat sheet cover. Taking the Polyethylene Rain Cover product a level further, Rain Cover+ has been designed to offer a heavier duty solution; made from 85% translucent PVC that weighs 330 grams per m2, it too features hemmed and eyeleted edges made from reinforced webbing with built in handles. The scrim reinforced nature of the PVC is durable, strong and repairable. Lightweight and durable, both covers in the Rain Cover range are available in 1, 2 or 3+ pitch sizes and are designed to be used single handed; making them a great, quick solution for keeping pitches dry before and during match play. With prices from under £300 they also represent great value for money. To provide the broadest range of ground cover options for clubs, total-play has also developed a range of mobile cricket pitch covers. The Rain Defender range of mobile cricket pitch covers has been designed to provide solutions to this challenge to suit a variety of budgets and situations; including PVC and steel-topped options, and with both dome and apex styles on offer. 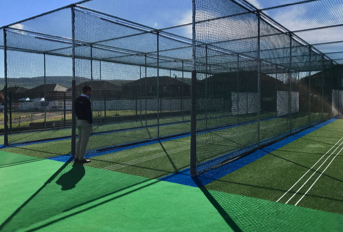 The popular ‘PVC Dome’ mobile cricket pitch cover design includes three levels of specification – Dome, Dome HD and Pro Dome. Meanwhile, the ‘PVC Apex’ mobile cricket pitch cover design features a unique “double span” main support structure. This is incredibly strong whilst maintaining a low, manoeuvrable profile. 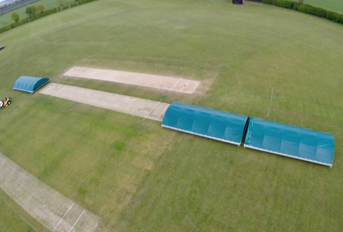 Finally, the Steel-Topped mobile cricket pitch covers – ‘Tuff-Cover Apex’ and ‘Tuff-Cover Single Slope’ – offer increased protection for sites prone to intentional misuse. 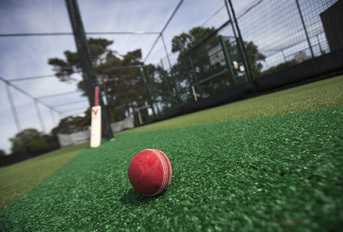 total-play’s Bio Cell was the first hybrid cricket ground cover to come to market; developed to offer a waterproof ground cover that combines the benefits of both flat and raised ground covers. 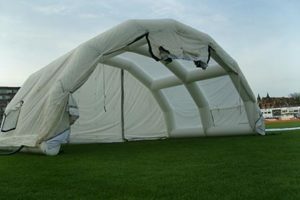 Constructed from the same unique fabric as The Climate Cover System, the pitch cover system can be used as either a flat sheet or inflatable raised cover. Used as a flat sheet, Bio-cell offers an easy to handle cricket pitch cover solution that allows air and nearly 60% of UV light to pass through the cover, whilst remaining 100% waterproof. This means the cover can be used for long periods of time without damaging the plant or risking quality of playing surface. When deployed as an inflated cover, it inflates via a high volume blower to form a raised dome over the cricket pitch. The constant, temperature controlled air flow enables the creation of the right climatic conditions for a healthy grass plant and can also assist in reducing pitch drying times. To summarise, cricket pitch covers can go far beyond being an occasional tool for keeping rain off pitches during a match. When it comes to selecting a ground cover to suit your club’s needs, they key is to do your research and invest in the best most versatile solution your budget will stretch to. Consider your ground’s geology – if you invest in mobile pitch covers, are you likely to see water running down the outfield and pooling underneath them? In which case, a larger flat sheet ground cover is likely to work much more effectively for you. Making the right choice and selecting a ground cover solution will, quite literally, pay dividends into your club’s profit pot.